Google is planning a brand new headquarters, and it gave Vanity Fair a sneak peek at the plans. 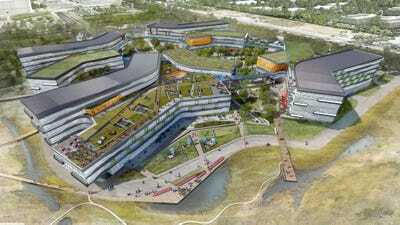 We’ve gotten some details on the new Googleplex from our own sources, as well. Google has already started drilling for its new building, which is going on land it leased from NASA in 2008. The construction starts this year, and Google is hoping to move in by 2015. It hired Seattle architecture firm NBBJ to design the new campus.The design, which you can see below, looks pretty dull from the outside. At least compared to Apple’s planned headquarters, which is a crazy looking glass circle. Steve Jobs described it as a giant space ship. No one would describe this as a space ship. It looks like any old boring campus. But, Vanity Fair says Google carefully studied how its employees work. Using the data it gathered, it designed the new headquarters to maximise employee productivity. What it lacks in looks, it makes up for in functionality. The bent rectangles are supposed to encourage employees to bump into each other. And despite the fact that the campus would be 1.1 million square feet, Google’s says no employee will be more than a two and half minute walk from another employee.